You know what to do, it's time to do it! The start of a new month is always a great way to kick-start a new habit. 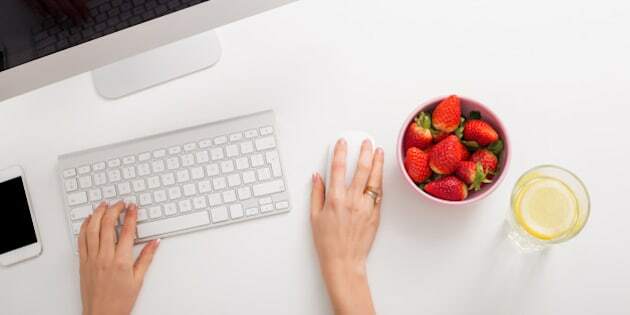 If you find yourself drinking many cups of coffee, eating out every day at the office or filling your desk with junk food, spring is the perfect season to rethink your diet. Of course, most of us know what it takes to eat healthy, but preparation and portion control seem to be the best bets. "Fifty per cent of your meal should consist of high fiber, low sugar food like vegetables and 25 percent of your plate should be lean protein like fish, egg, lean poultry or beans, lentils or tofu," says registered dietitian Kiran Bains of edovivo. "The other 25 per cent should be a starch or carbohydrate that is high in fibre like whole grain pasta, quinoa or wild rice." And while this may sound easy, it really starts with your grocery shopping, Bains adds. "Making things convenient and easy to grab is key." For starters, meal planning on Sunday and Wednesday nights will keep you full and nutritious all week. Make some time in the evening to cook up your favourite soups or rice bowls, keeping in mind Bains' rules for portion control. Check out Bains eight tips below and let us know, how do you attempt to stay healthy at work?